Happy New Year – We’re stuck! 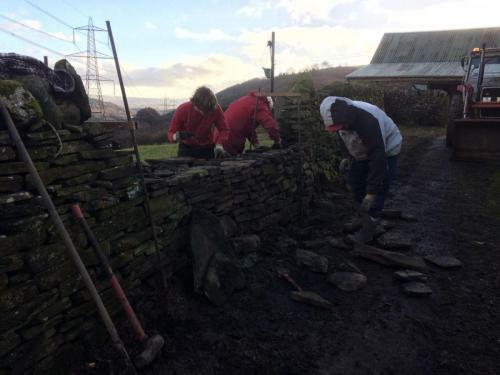 Some members of the branch decided to do a spot of dry stone walling on New Years Day to start the DSWA 50th centenary year in earnest. A few texts, phone calls and emails and it was decided that Libanus would be a suitable venue to get some gaping completed. Alas it was not meant to be. Despite turning up early, the Brecon rain got the better of ‘us’ and five adventurous spirits quickly realised that off-roading to the site was impossible, especially as Secretary Brian got his 4×4 stuck (but we won’t talk about that). On returning back to the road our options were reviewed. The choices were: cooked breakfast somewhere, go home or find somewhere else to wall. 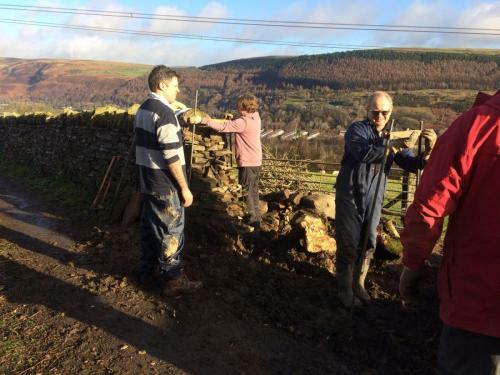 The breakfast just lost out to the decision to repair a wall in sunny Aberfan! Thirty minutes later on the valley side of Aberfan village the New Years Eve party surveyed the remnants of an Elm tree which had grown through a field dry stone wall. Contrary to wisdom this had been cut down to ground level which did not leave any leverage to remove the tree (but we won’t talk about that). Brian, Ian, Luke, Tomos and Jamie quickly realised it was time to start digging. First off a giant John Deere tractor was employed to attempt the uproot of the stump. 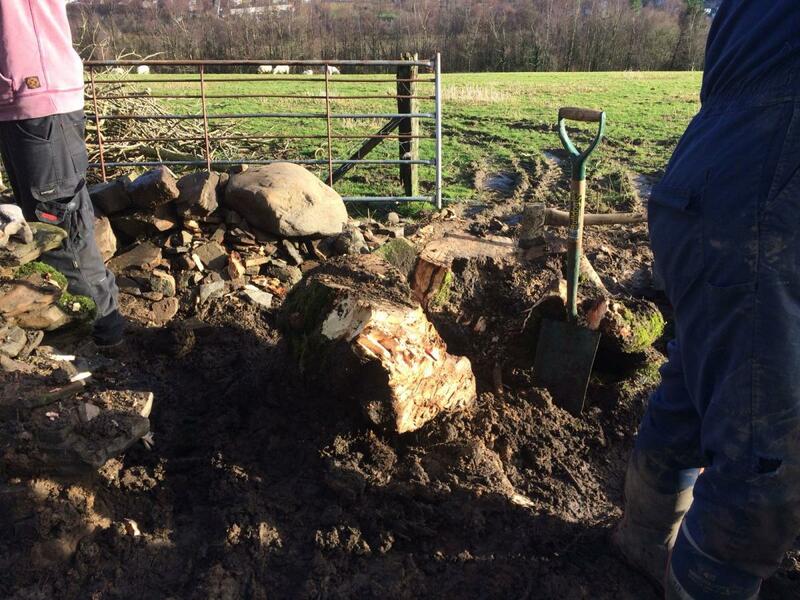 This failed gloriously and the stump sat there laughing at ‘us’ and the huge tractor. “Ok we can’t pull or dig it out, we’ll cut it out!” was the next tactic. Now DSWA (Welsh) members come in all shapes, sizes and backgrounds; fortunately on this occasion one of the party is a knife/tool sharpener by profession. Alas a very sharp axe blade was presented to hack the stump to pieces. 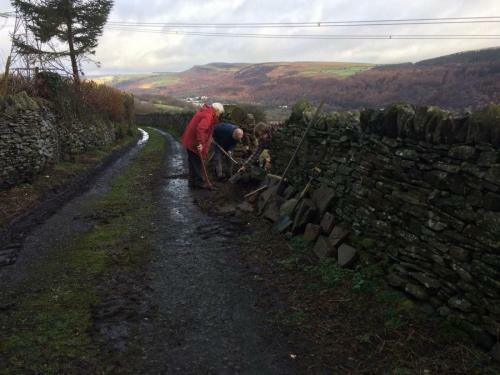 After approximately 15 mince pies worth of energy (40 minutes) a third of the stump had been hacked and pulled out by a smaller tractor. The decision was made to ‘bridge’ over the existing outer stump as it was going ‘nowhere fast’. The rest of the day turned out to be a pleasant affair with light showers and even sunshine. Members were even treated to a few cups of tea in the nearby farm house. At 2.30pm the gap was coped (with what we could find! ), the farm steward thanked us for our efforts by stating they were ‘elated’ by our help and it was time to say goodbye to friends. A wet day salvaged into a good day. Happy New Year DSWA and Happy 50th Centenary.